The next morning after freshly squeezed OJ, pan dulce and carved tropical fruits I was told to get ready, “vayamos, we are going out for lunch.” The four of us piled into a Chevy Cobalt and drove past the monolithic hotels towering over palm lined driveways with names like “Dream”, “Oasis” and “Solaris”. We drove past Famous Daves, TGI Fridays, Mcdonalds and Cantina Margarita y Marijuana. The smell of the sea was fading in the distance as we continued into the congested heart of the city. Around the edges of parks and bus stations there was the smell of bubbling grease and oil soaked churros emerging from oil barrel deep fryers. We parked in a lot near a bus station and were immediately surrounded by kids selling chicklet gum and mustached teenagers with a fistful of newspaper in one hand and a spray bottle of vinegar in the other. My hosts led me through a row of bushes to a unassuming strip mall. Sandwiched between a convenience store with horchata churning outside and a candy shop was a tiny counter of a space with three small round tables outside covered in plastic tablecloths, a jar full of silverware and two jars of watery salsa. We ordered inside where a TV blared news from the corner and Mexican tourism posters dotted the walls. There were only two of choices, which didn’t seem to be listed anywhere, tacos al pastor and carnitas tacos. We ordered a few orders of both. The al pastor was meat sliced with a machete from a roasted spit which resembled a shwarma. After carving off several slices of meat, the woman chipped off pieces of pineapple and served three tacos on a bright red plastic straw plate lined with checkered paper. 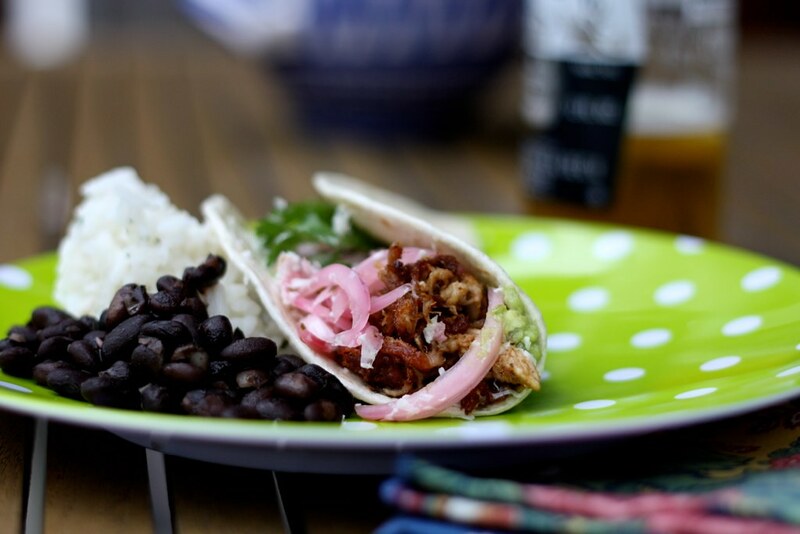 The carnitas were lifted with a tong out of a cast iron pan filled almost to the brim with a muddied black water. The woman held the meat over the liquid and let most of the moisture fall off before stacking it on our corn tortilla and pinching a salad of radish and cabbage on top. Holding the tortilla at an angle while meat juices dripped from inside, I took my first bite. There was a complexity of flavor, a mash of lime juice and smokey tobacco that had I eaten this dish at any other place I may have been worried about. Here the flavors were brewed out of tradition, the delicious funk of a well worn cast iron pan . With each bite I craved more. I spooned a little of the watery salsa from the dish and the tacos came alive again, this time with the heat of chilies and garlic. That lunch and all it’s images flicker in the back of my mind and still linger on my tongue long after many of those images have faded. Like memories of childhood, you know it shaped you in some way, your sense of taste, your palette, your understanding of the elegance and perfection of food cooked with heart and served unadorned. Generously salt and pepper pork. Grill each side for five minutes until charred. Place grilled pork in large stock pot. Add onions, garlic, peppercorns, red wine and enough water to come halfway up the sides of the pork. 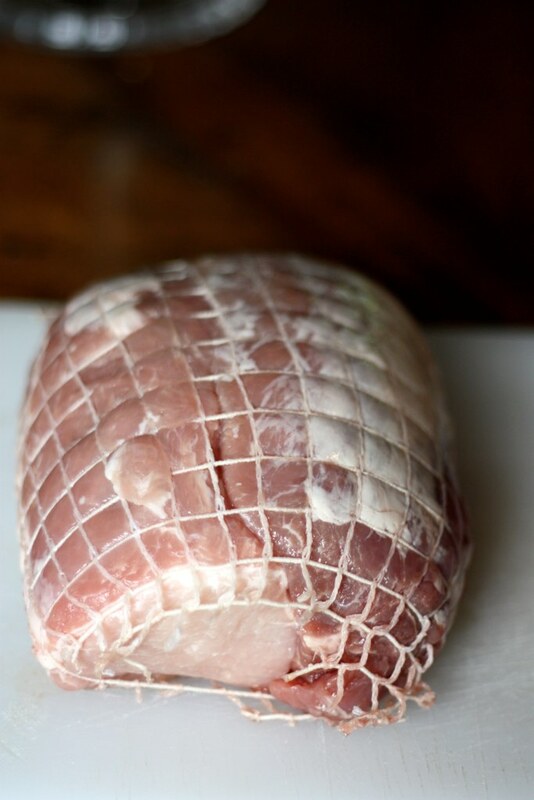 Bring to a boil over high-heat, reduce heat to low and cover with a piece of parchment cut into a circle. Allow to cook for 4 hours or until pork is fork tender. Turn off heat and let pork cool to room temperature in stock. Remove pork from pan and pull apart using two large forks. 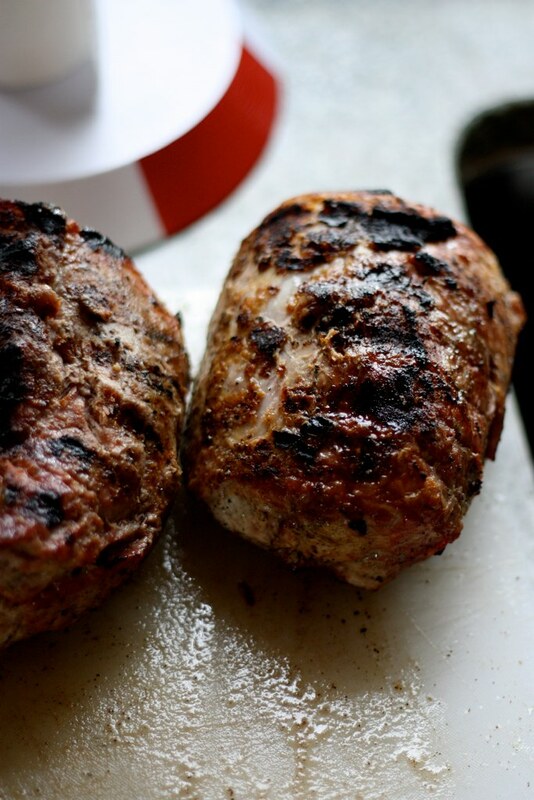 Sprinkle pork with paprika, cumin, oregano, cinnamon and salt and pepper to taste. Mix pork and spices together and taste, add more salt to taste. Place a large skillet over medium-high heat with a tablespoon of canola oil. Pack pulled pork into hot skillet. Pour a 1/4 cup of the pork stock over the meat. Allow meat to sizzle for five minutes without touching or until the meat touching the surface of the pan gets ultra crispy. Remove from heat and spoon carnitas into serving dish. Serve carnitas with tortillas, cilantro, tequila red onions, Tapatio hot sauce, a couple shots of Patron and an ice cold Dos Equis. In a small saucepan combine tequila, lime juice, agave syrup, OJ, h2o and salt. Bring to a simmer, turn off and stir until combined. 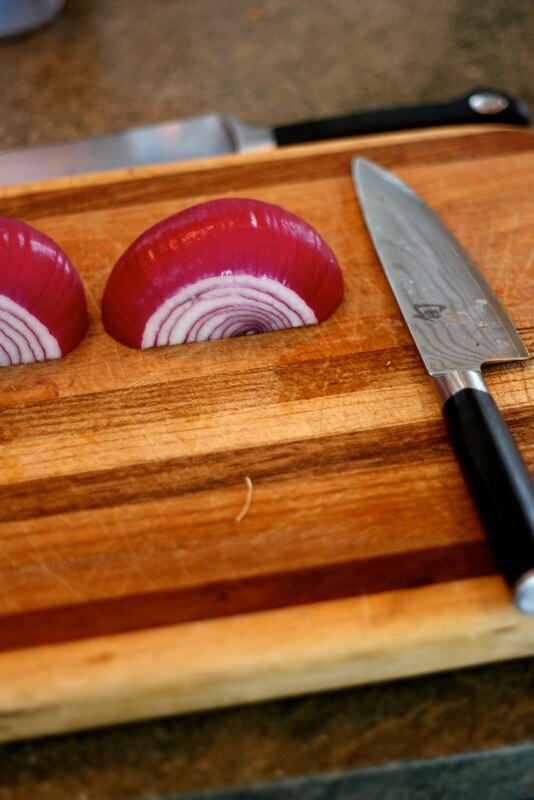 Cut large red onion in half, then cut off both ends. 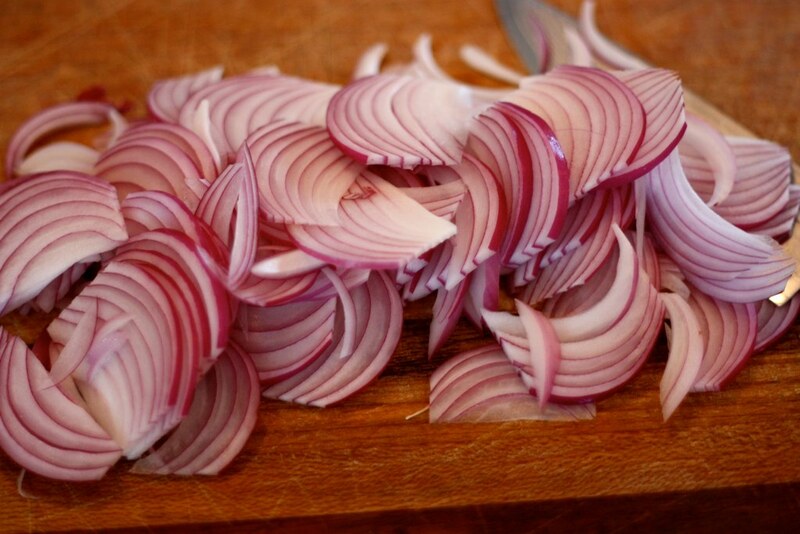 Cut thin strips of onion by cutting at an angle perpendicular to the ends. 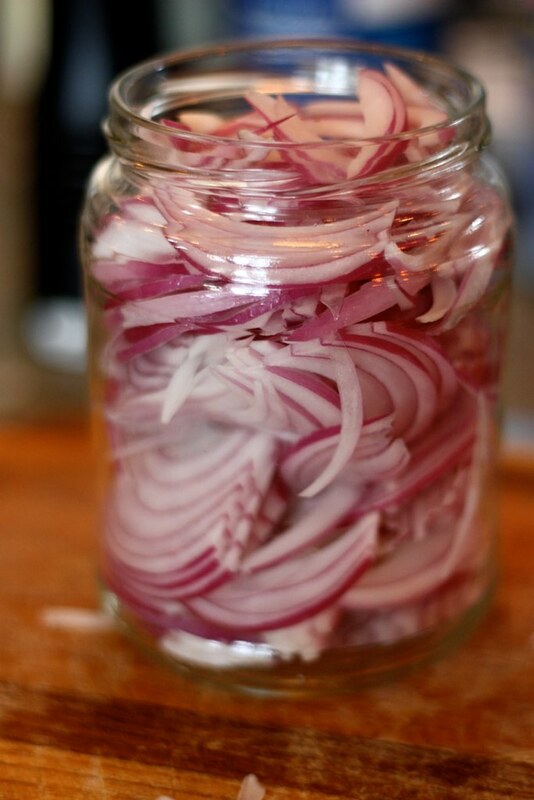 Place onion strips into a large enough jar to hold them all. Add the rest of the ingredients to the jar. Pour hot liquid from saucepan into the jar, cover tightly and shake until ingredients are well combined. 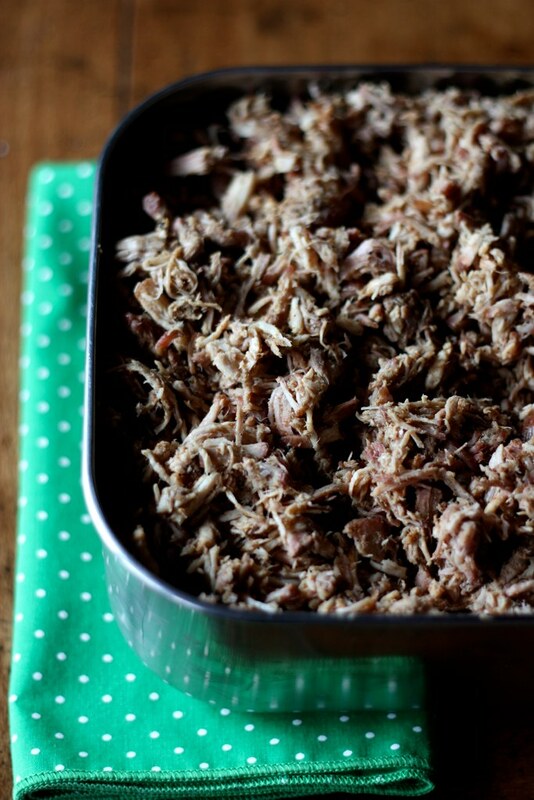 Chill overnight and serve with carnitas. This entry was posted on August 23, 2010 at 9:30 am and is filed under Recipe. You can follow any responses to this entry through the RSS 2.0 feed. You can leave a response, or trackback from your own site. nice one. 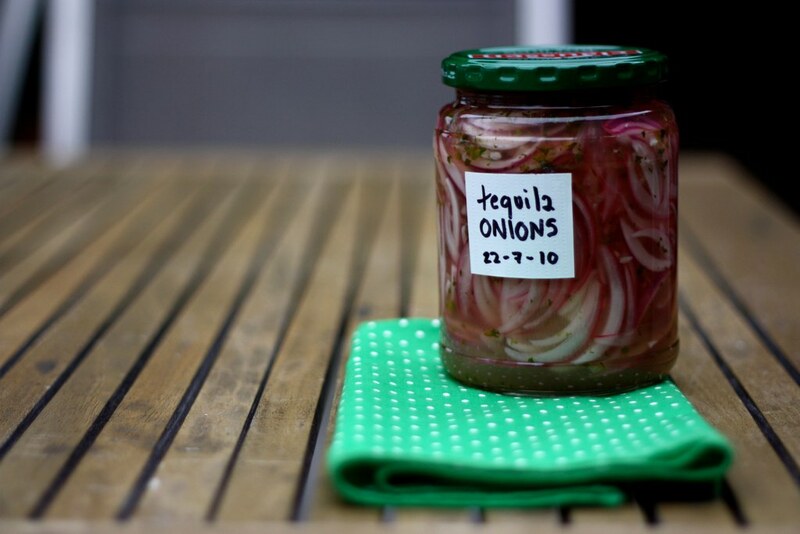 I’ve had ‘pickle red onions’ on my list of things to do for awhile and i’m all about tequila this week (about to do some serious margarita testing in town)…now you’ve motivated me to get to those onions! 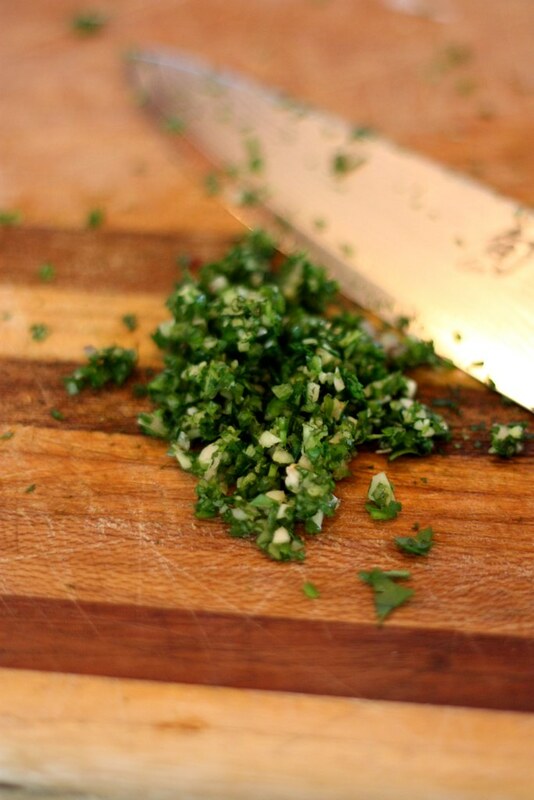 A great recipe…thanks for sharing it. Bob came home starved, and VOiILA …..it was a great dinner.! I started it early this morning and just let it simmer throughout the morning and afternoon. I serverd it with cilantro,tomatoes, refriend beans,salad and it was awesome. I will definately serve it to friends and look forward to doing so. Erik and Jana will love it!